Brainstem auditory evoked response. Right ear responses are shown on top and left ear on the bottom half. Most contemporary evoked response machines are general purpose computers with specialized software and hardware to enable recording of physiological potentials. In the author's clinical practice, units made by Bio-Logic are presently used. Brainstem auditory evoked responses (ABR), also known as auditory brainstem evoked response (ABR), test both the ear and the brain. They measure the timing of electrical waves from the brainstem in response to clicks or tone bursts in the ear. Computer averaging over time to filters background noise to generate an averaged response of the auditory pathway to an auditory stimulus Three waves (1, 3 and 5) are plotted for each ear. The waveform represents specific anatomical points along the auditory neural pathway: the cochlear nerve and nuclei (waves I and II), superior olivary nucleus (wave III), lateral lemniscus (wave IV), and inferior colliculi (wave V). Delays of one side relative to the other suggests a lesion in the 8th cranial nerve between the ear and brainstem or the brainstem itself. 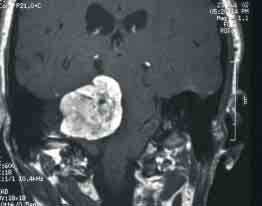 The main indication for ABR is when an acoustic neuroma is suspected. This generally comes about when there is an asymmetrical sensorineural hearing loss. ABR testing is more cost effective for this purpose than MRI (Rupa et al, 2003; Koors et al, 2012), but MRI provides additional information. The most reliable indicator for acoustic neuromas from the ABR is the interaural latency differences in wave V: The latency in the abnormal ear is prolonged. According to a meta-analysis of ABR, they are 93.4% sensitive to acoustic neuroma. However, Rafique et al (2016) found them only 80% sensitive and suggested that ABR testing was less effective than MRI testing in Denmark. ABR testing may also be useful in situations where an auditory neuropathy is suspected. In this case, it may be combined with otoacoustic emission testing. ABR testing may show some subtle abnormalities in persons with tinnitus (Kehrle et al, 2008). ABR's are commonly abnormal in brainstem disorders such as multiple sclerosis, brainstem stroke, or brainstem degenerative disorders. These are much less common than inner ear disorders, but also are intrinsically much more dangerous. ABR testing requires reasonable high-frequency hearing. This means that it is often not worth doing in persons over the age of 70. We recommend that either an audiogram or at least a screening test for high frequency hearing be done prior to ABR testing. An example of an abnormal ABR (for the left ear ) is shown in Figure 1. The case history is found here. Stacked derived-band ABR, basically band-passed computer processed ABR, may theoretically identify small, intracanalicular acoustic neuromas with greater sensitivity than a standard ABR. This technology -- a software program -- has been patented by one of the audiology equipment companies (Bio-Logic). The stacked ABR uses the amplitude of wave V as the measurement point: Wave V of each derived-band ABR is aligned and the time-shifted responses are summed. As MRI testing provides more information, we do not use stacked ABR in our practice in Chicago. VEMP testing would also seem to have more promise than ABR, because VEMP's are testing the part of the inner ear first affected by acoustics. The ABR test is not a painful test, and in fact, it is often best if the patient goes to sleep during the test. There will be clicks heard in the ears, and wires attached to the head to record electricity from the ears. The ABR test can take as long as 1 hour. Who does ABR testing and who should interpret ABR tests ? 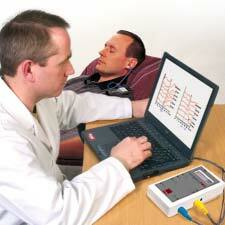 ABR tests are commonly performed by an audiologist or an electrophysiology technician. Audiologists are often associated with otolaryngology practices (ENT doctors), while electrophysiology technicians are often associated with Neurology practices. It is not a difficult test and does not require much training for one to perform. Thus technically, either setting is quite reasonable. Because hearing testing is absolutely required to interpret the test (see above), often the most convenient process is to have an audiologist do the ABR test and audiogram in a single sitting. Reading of the ABR test is more problematic because ABR's may be obtained in settings relatively unfamiliar with CNS disorders (i.e. most otology practices) or settings relatively unfamiliar with ear disorders (i.e. most neurology practices). Where are the norms ? Strangely enough, most texts on ABR suggest that you develop "your own norms", and run at least 20 normal subjects. I suppose they are suggesting that there are some mysterious forces present in different areas of the country that cause people in, say Florida, to have different ABR latencies than those in Chicago. As everything in electrophysiology changes according to age, logically, you would want 20 normal subjects for every decade of age, or about 200 subjects in total. It does make sense that different devices -- might contain different electronics, and have slightly different latencies. It doesn't make sense that the same device should act differently in different parts of the world. Our thought is that manufacturors should provide an openly accessible norm database when their device is approved for sale. In our opinion, ABR's should always be interpreted by a physician familiar both with disorders of the ear and brain as well as the patient's clinical history. This generally means a subspecialist, either an otologist (an "ENT" doctor who just takes care of ear diseases), or an "otoneurologist", a neurologist who specializes in ear diseases. Experienced and extremely well trained audiologists, particularly those with academic doctoral degrees (here we mean Ph.D, not Au.D. ), may be also be competant to interpret ABR's. However, while audiologists are generally well informed about technical aspects of ABR testing and they are fairly well informed about many ear pathologies, they are nearly always untrained in and unfamiliar with neurological conditions that cause abnormal ABR's, especially central disorders such as MS (multiple sclerosis) or brainstem stroke. In our opinion, a "stand-alone" audiology or other non-physician practice (such as is often organized for the main purpose of selling hearing aids) should not interpret ABR tests. This is because the testing is done without any physician oversight and/or knowledge of the patient's specifics, may not be able to interpret central ABR patterns other than in the most cursory way. Otologists (ear specialists) may also be unfamiliar with central ABR patterns. Similarly, a general neurologist, even one certified in electrophysiology, may often be unaware of the many interactions between peripheral ear disease and ABR test results. For ABR testing, a team combining an experienced audiologist and otoneurologist is optimal. However, this may not be available in every clinical setting and compromises may be necessary. ABR testing is a mature technology and nearly any device on the market can do an acceptable job. If you are in the market for a new ABR device, we think it is best to get a multipurpose machine - can it do ECochG testing ? VEMP testing ? Other types of evoked responses such as SSEPs and VEPs ? Does it do OAE's ? Does it interface with NOAH (a database program for audiology) ? If it is an external device, how does it connect to your host computer (USB is best). A stand-alone "box" should cost about $20,000 (see comments below about the gigantic mark-up on these devices). Examples of vendors include Bio-Logic, GN otometrics, and Interacoustics (alphabetical order). In our practice, we use several units by Bio-logic (Nav-Pro). Be sure to consider the company's technical support, as it generally seems to be hugely problematic in this industry. Be very cautious if you cannot reliably reach technical support when you call them, or if technical support is an option that costs more money. Monopoly and regulation. While ABR devices, like contemporary audiometers, are basically just PC's with about $1000 of extra hardware added, they sold by just a few global companies. In other words, the core cost of these devices is only about $2000, but they are sold for about $20,000 -- a 10x mark-up. Practically, because they are always breaking, you really need 2 of these per office. In the US, evoked potential devices are also regulated in a rather suspicious ways that seems to have more to do with protecting companies from competitors than protecting the population. After all, how could some device that measures electricity from the inner ear hurt anyone ? On the other hand, a new and better device from a small innovative company could hurt sales of a huge audiology conglomerate. The FDA forced a recall of another evoked potential device - -VEMP equipment -- from "Intelligent Hearing systems" in 2009. This is in spite of the general consensus that VEMPs are very useful diagnostic tools. This sent a very ominous message -- namely -- don't innovate -- because the FDA is "protecting the public" from better technology. Think monopoly here with the cooperation of regulators. ABR machines are very expensive, and every time another company is bought by a huge conglomerate, the price of this old technology goes up another $5000. This is similar to the monopoly situation with hearing aids, and hearing testing devices, which are sold for prices that hugely exceed their cost, by a few global companies. Used ABR machines: Be very cautious in purchasing ABR equipment from used-equipment vendors. Think "used car salesman". If you can't obtain a PDF of the manual for the device -- we think that you should look elsewhere for a device. You will need technical support. We are always sending our boxes back to have the moving parts -- cables, connectors and sound-generators -- replaced (typically at $1000/return). This is why you need at least 2 of these in your office -- one to keep going while the other is in service. Look also to see what the device does "out of the box", and whether or not additional software is needed to do what you want. If you purchase a unit, we also suggest insisting on a 1 month return, should the unit not work out in your environment.